The Southern Cape is abuzz with excitement about the approaching festive season. With people from every corner of the country already making plans to converge on the area for the holidays, the hype has also started building for the Great Brak Grabadoo, the Southern Cape's premier summer sporting event for running, walking, fun and especially mountain biking enthusiasts. Even though mountain biking in the Southern Cape is a year-long pastime, it comes to a climax every year on the last day of the year with the riding of the Great Brak Grabadoo. This year is no exception and promises even more enthusiasm, adrenaline and oomph to make the 31st of December a day to remember of fun and family in phenomenal surroundings. Holidaymakers come from far and wide to take one last stab at the old year in order to start the New Year on a fit and healthy note. "Apart from fun, participating in the Great Brak Grabadoo felt like cleaning the slate of the old year. In some ways, that got my New Year started on an incredible high," commented one of the participants of the 35km mountain bike ride last year. Due to an exceeding demand for the mountain bike routes, organizers have added new and amended old routes, broadening the allure and giving participants exactly what they have been asking for. Mountain bikers can choose from 4 exciting routes including some wonderful new twists and turns to the existing routes – 15km (R55), 31km (R65), 42km (R75), 66km (R85). 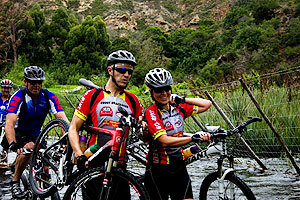 Remember that if you do not have a Cycling SA license you will have to buy a temporary license (R35) for the race. Because of the increasing concern for the safety of the road bike contest at that specific time of the year, organizers have also decided not to continue the road bike part of the Grabadoo. Runners, walkers, families and even pets can still participate in the most beautiful walk in the Southern Cape around the Great Brak River in a 4.8km (R35) route. Whales and dolphins can literally fall half asleep. Their brain hemispheres alternate sleeping so the animals can continue to surface and breathe.